Since getting my first iPad on the day it was released two years ago, I have enjoyed the challenge of experimenting with it in new ways—seeing how I can use it effectively in my daily work and professional life. This has involved trying lots of apps and removing lots of apps to see which ones stick around to become useful. It has also meant experimenting with the iPad in class or to document class work. Along the way I have found some new uses like presenting visual “notes” on films that I imagine will become regular parts of my teaching. Some other ideas like using the iPad for video homework in my anthropological film class—are just proof-of-concept at this stage. After nearly two years of daily use, I have settled into about a dozen apps that work really well for me, and have become a permanent part of my teaching and research workflows. I keep five apps on The Dock at the bottom of the first page. These are the apps that I use most often and that I want in an easy-to-find location. I have Apple’s Calendar App synchronized with my Google calendar and my univeristy-issued Groupwise account configured with the Mail App. I choose to use Safari as my primary browser because I can sync the bookmarks with my office desktop and my personal laptop using iCloud. Since I regularly have to access Settings, such as 3G or Airplane mode, I also keep that app on the Dock. Finally I put my Dropbox app on the dock. The Dropbox app makes the iPad really useful as a work tool, and I couldn’t imagine my iPad without it. I’ve had a Dropbox account since giving up on Apple’s iDisk many years ago. The Dropbox application for OSX sets up a cloud-based folder that synchronizes between all of my machines—my home computer, my office iMac and my field laptop. Because Dropbox synchronizes across every machine I can, for example, begin making a presentation for class on my office computer drop it in my Dropbox folder and then continue working on it at home in the evening. When it comes time to show the presentation in class, I pull it up on my iPad and I am ready to go. At the beginning of each new semester I drag and drop a copy of the entire semester’s class notes and presentations in my dropbox folder and everything I have done from previous years is right there waiting for me. I “favorite” the files that I often use, such as syllabi, so that they are saved locally on the iPad. At the end of the semester I just move the class folders out of Dropbox, back on to my desktop. Dropbox also has a PC client, so if you happen to have a PC, it is an easy way to move between formats. Do you know how you can easily tell if someone has never used Keynote for presentations? They are still using Powerpoint. When I moved back to Macs in 2002, it was simply because OSX made it incredibly easy to manage images and video. iPhoto has been a simple and intuitive program for managing two large libraries of over 25,000 photos each—our personal library at home and my fieldwork/teaching library at work. With Keynote, I can drag and drop photos from that library directly into simple slideshows for class. I then drop the Keynote presentations into Dropbox on my desktop and then pull them up in the Keynote app on the iPad. I plug the iPad into the VGA cable in the classroom with my iPad VGA adapter, and I am good to go. 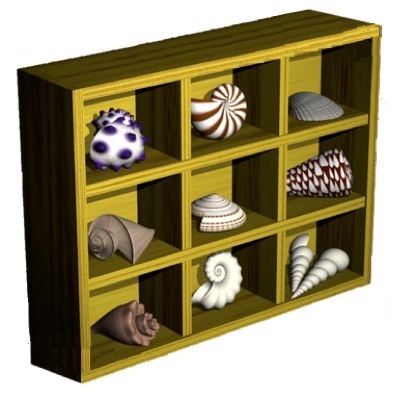 In the early 2000’s my university, like most across the country, spent a hefty sum of money to install computers and video equipment and fancy “tech podiums” into every classroom on campus. The iPad has made all of that equipment obsolete. All one needs now is a digital projector and a screen. Of course, again, if you have a PC and use Powerpoint to create presentations, Keynote can import and play them on the iPad for you. Until recently I used the Pulse newsreader app, and I quite liked it’s simple interface. That was, however, until they couldn’t just leave it alone and started adding all kinds of crap to it that just made it irritating to use. (Somtimes it really should be enough to just make a great thing and not muck it up with too many useless features.) Anyway, I have switched to Flipboard. While it is not quite as customizable as Pulse was, it has a really nice “feel” to it—formatting webpages, blogs, Twitter feeds and even Facebook into a nice digital magazine format. Often every morning and every evening I spend some time using Flipboard to easily scan through blogs and news. Simplenote is one of the apps that I not only use very often, but that reminds me that the simplest things are often the most useful. This app doesn’t do anything except allow you to type simple, text-based notes, tag them with relevant tags, and save them to your iPad. No muss. No fuss. No unnecessary integration with outside services. The free version just asks that you deal with a reasonable advertisement. Like Dropbox, the real power of the app lies in the way it can integrate with my other computers. Using a small piece of software called Notational Velocity on my desktop and laptop I can synch my simplenotes. In daily life I regularly, for example, take notes on my iPad at a meeting and then when I get back to my office I can saved the synched notes to a folder on my desktop. Or, even more useful, I can quickly type classnotes into my desktop before class and then easily pull them up for use in class. Because they are text-based notes, they are easy to move around and format. Before I finish up reviewing the apps on my iPad’s Main Page, I should take a minute to talk briefly about the iPad’s built-in Videos app. Most people that I see use the Videos app for entertainment—watching TV episodes or movies on airplanes. The app, however, can be really useful in the hands of a professor in class. I talk quite a bit in an earlier post about streaming video, so I won’t spend space here revisiting that. The thing that is wonderful about the iPad, is that anything you can rip on to your desktop you can drop into iTunes and then synchronize with the iPad. Sure, one should be careful of copyright issues, but short clips of materials owned by the campus library for use in a lecture should fall under educational fair use. For ripping DVDs to my iMac I use Handbrake, a dead simple piece of software with very useful presets for iPads and other devices. I also use Videobox to download flash videos from sites such as YouTube so that I can store them on my iPad for including in Keynote presentations or video playback. There are lots of similar programs and browser addons for PCs. I keep all of my ripped files and downloaded flash bits in playlists on iTunes that I can easily synchronize with my iPad anytime I need them. The second page of my iPad is where I keep collections of useful applications that I use for more specialized tasks—less often than those apps on the main page. I have a collection of Test Apps the place I put apps that I am currently testing or playing around with and a collection of Bookmarks of webpages that I want to be sure to watch or read at a later date. A recent one of these, for example, is a bookmark to a video capture of a lecture at the University of Minnesota that I want to watch when I have some extra time. A collection of School apps has a simple and overpriced app for accessing my university’s GroupWise email system and the app for accessing Blackboard. There is a collection of Games that I keep on the iPad for the casual diversion—or procrastination. I also have an Extras folder where I hold apps that I rarely or never use. 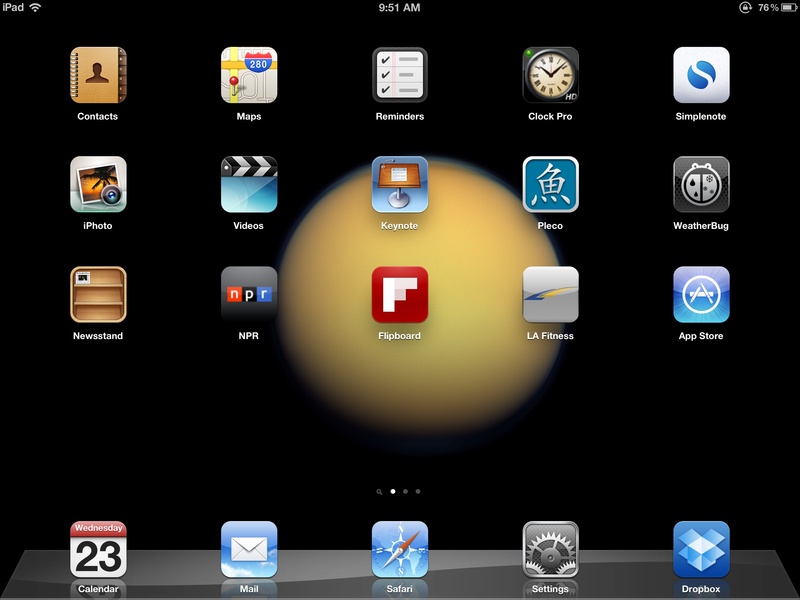 Most of these are built in iPad apps such as the iTunes store, the Game Center, Photo Booth or the Notes App. Without going through every app that I use, there are a few of these collections that are useful for my professional life and might be of interest to others. Digital Book/Document Readers: When I first got my iPad I spent quite some time reading a few digital books. I really wanted to like reading on my iPad—after all, I had just spent hundreds of dollars on it. I liked the idea that the iPad might free me from the academic’s largest burden, the printed book. Alas, it was a less-than-satisfactory experience. Digital book readers do not easily allow margin notes or the quick scanning, paging back and fourth, that comes so naturally to many people who read academic books. I also was surprised how quickly I would forget that I own a book, because it was not on my office bookshelf. And, of course, digital books cannot be lent and are locked in to whichever company you buy them from. Sometime soon there will be a battle about this issue. Someday I hope a critical mass of people will notice that they need Apple and Amazon to access the books they have purchased. So for the time being I continue to prefer real books, to digital screens. There are, however, some exceptions. I once bought an early release digital book on Amazon that I couldn’t get at my local bookstore. I also regularly purchase a book or two while traveling. 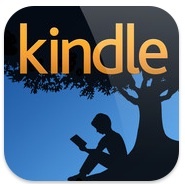 For my digital books, I prefer the Amazon Kindle App for iPad for a few reasons. First, they are not Apple and they have a better selection of books. Second, their Kindle system has a really cool feature. I can access a list of all the highlighted sections of the books I read through a special Kindle website. For some time now, I have thought it would be really cool if an entire class were using Kindles and could share each others’ quotes. As a professor I think it would be really cool to be able to see the sections that students in class thought were interesting and relevant. It would be an unacceptable trade, however, for locking the entire educational enterprise to a single company. One indespensible app that I use very often is GoodReader. One of the first apps that I ever purchased, it is a very robust and versatile PDF reader. The program has a useful file browser and can connect to various internet servers or cloud-based services such as Dropbox or iCloud. GoodReader has a number of different tools for marking up PDFs and making notes. It also offers the option of retaining a clean copy and saving the marked-up version as a separate file. This is the app that saves paper. A few months ago I was on the search committee for our university’s new provost, and it took me three minutes to download the hundreds of pages of application materials on to my iPad. At every meeting I had the whole collection of documents in my bag. These days I pretty much print everything as a PDF on my Mac, save it to a folder in Dropbox and then open it up on my iPad. A few days ago I was sent a manuscript by e-mail to review for a journal—I opened the PDF in GoodReader, went to work on it and then plopped my iPad next to my laptop when it came to writing my comments. I didn’t print a thing. So, while I am not a fan of ebooks, readers like GoodReader are really fantastic for all of those piles of memos, reports, reviews, and committee documents. 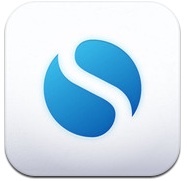 Speaking of documents, there is another recent app that I bought that I can’t recommend enough. If you have ever needed to scan and send a document, but were nowhere near a scanner or fax machine, Scanner Pro is what you need. The program is very simple, really. It uses the iPad’s camera to take a photograph, allows the user to select the portion to be “scanned” and then it transforms the image into a clear black and white image that can be sent by e-mail. This is a fantastic way to transform a physical document into a “scanned” PDF or move around signed documents digitally. I am looking forward to using this application when I do fieldwork in China next month. I’ll be able to use this program to scan newspaper articles or other documents that I might come across. If I were a historian, I would love this app in the archives—I could use it to take photos of everything I might need and then I could store them in folders in GoodReader, or move them into a folder on Dropbox that I could then open on my desktop. Fieldwork/Research Apps: Scanner Pro is an example of an app that is dual use—for both the business of academic work and the research. There are a few apps on the iPad that I use fairly extensively for research.I often use the built-in camera and Photos App to take images of objects or locations they people reference in conversations. Working in Chinese, being able to take a photo of an unfamiliar character or phrase is incredibly convenient. I can easily put the photo into collections that synchronize with my desktop, e-mail it to someone, or better yet, just let it become part of my iCloud photostream—instantly sliding through the Internet to my home computer back in the US. Photos and images that I gather in one location or during one conversation can quickly be pulled up during another conversation or interview and be available for discussion. (In the classroom, I have gotten in the habit of regularly taking photos of the whiteboard at the end of my class period. I can either keep these to remember where I left off, or I can share them with students. I remember just a few years ago when folks were all excited about so called “smart boards”—another unnecessary waste of money that my iPad now does for free.) Flickr does not have a very useful app, so I use FlickStackr to move photos to my Flickr account. I have an Eye-Fi card for my camera that I have connected to my iPad. This allows me to move photos from my camera to my iPad and then directly into my Photostream—a great way to back things up while I’m on the road. I have found the iPad to be a very unobtrusive object to have on the table while doing interviews. It is just an entirely different feel to the kinds of tape recorders or minidisk recorders that I used while doing my dissertation fieldwork. I can use the iPad to record interviews and even take notes on it during interviews. For recording interviews I have used a few different apps, but have settled on AudioMemos. The app is easy to use, time and date stamps recordings, allows basic editing of recordings and quality of the sound. Recordings can be e-mailed or uploaded to iCloud. The coolest feature, however, is that AudioMemos can act as an Internet fileserver—which means I can access the recordings on my iPad through the web from a different computer! While I haven’t done this, if I had an interview in China and came home with some questions, I could email or Skype the person I interviewed—give them the link to my iPad, allow them to listen to the recording and then ask my followup questions. This opens up some interesting avenues for collaborative research and post-fieldwork dialogues! Finally, I since the early days of having an iPad I have been using Penultimate as a sketch/drawing app. For many folks, it is not really that necessary to have a drawing program, but I have found it very useful for sketching during interviews. Again, because I work in Chinese, having a drawing program is useful for having people I’m talking with write down characters I might not know, or sketch directions or images of things that we are talking about. Penultimate is a very simple drawing program with very nice feel to it. I particularly like how I can create little mini virtual sketchbooks. Sure, they could use paper, but I have this habit of losing all of the many pages and scraps of paper that people have written things on. 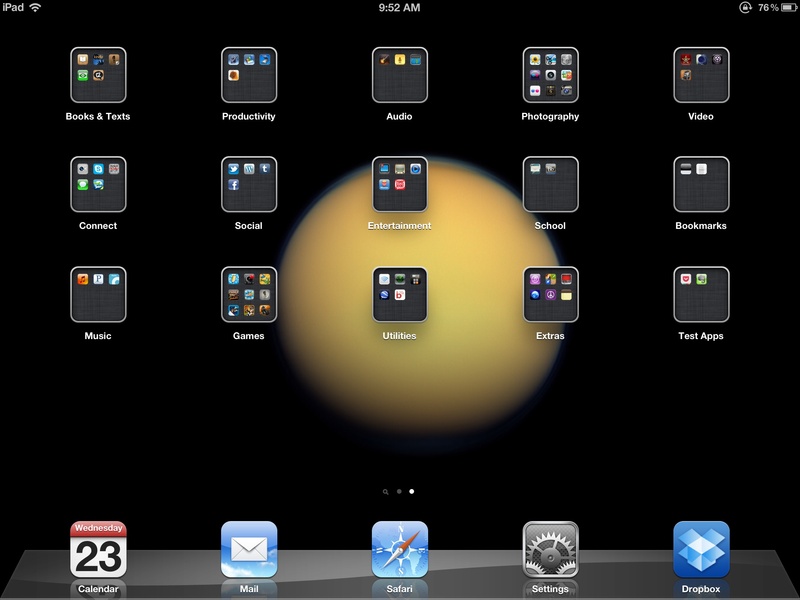 Keeping everything on the iPad means I can back it up, move it around and keep everything together.